The section contains settings that control screen-space reflections (SSR). Toggles the SSR effect on and off. 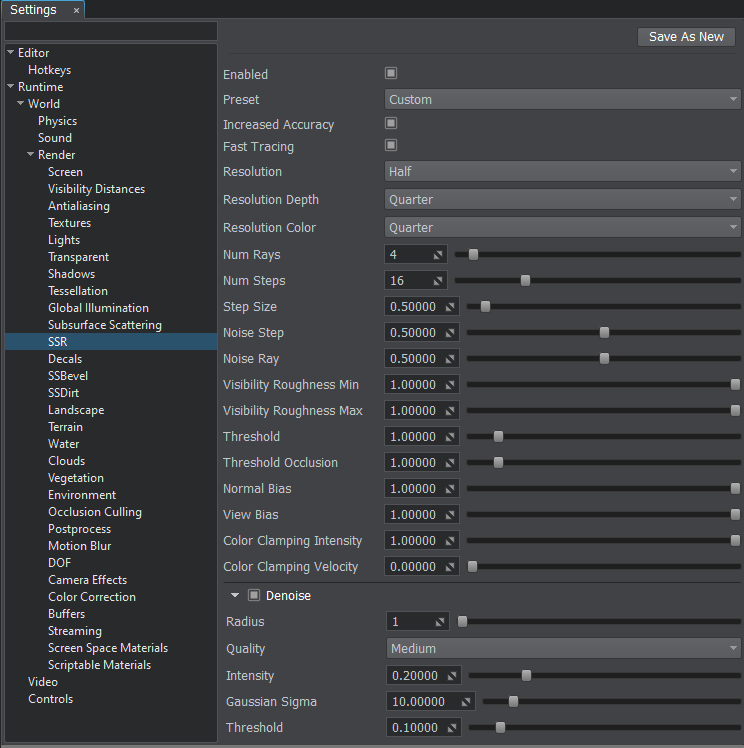 Toggles the importance sampling mode for the SSR effect on and off. Importance sampling provides more accurate but slower calculation of SSR roughness, reduces artifacts around objects that can appear at low resolution (lower than full). Toggles increased accuracy of ray tracing for the SSR effect on and off. This option reduces visual artifacts around objects, which can appear at low resolution (lower than full), by increasing accuracy of the last step. Toggles noise reduction for the SSR effect on and off. Toggles fast tracing for the SSR effect on and off. This mode makes it possible to obtain distant reflections using low number of steps while keeping performance high. However, tiny objects may not be reflected. Disabling this mode improves quality but significantly drops performance. Can be controlled by render_ssr_resolution console command. Resolution of the depth buffer used for SSR calculation. This option affects detailing of reflections of tiny objects. To gain performance, this option can be set to lower values while enabling Increased accuracy. Resolution of the color buffer used for SSR calculation. This option significantly affects performance. Number of rays of SSR traced per pixel that are used to calculate rough refrections. Using more rays provides more precise SSR roughness calculation, however, it is more expensive. The option is available when importance sampling is enabled. Number of steps of SSR per ray that are used for trace calculation. Defines accuracy of reflections and causes a reasonable performance impact. The higher the value, the more accurate obstacles between objects are accounted. Size of the trace step used for SSR calculation. The higher the value, the longer the trace. However, tiny objects may be missed. The lower the value, the more detailed reflections of the tiny objects will be. Intensity of the step noise used for SSR calculation. This parameter is used to reduce the banding effect of tracing by using the noise. Intensity of the ray noise used for SSR calculation. This parameter is used to reduce the banding effect on rough reflections by using the noise. Can be controlled by render_ssr_roughness_quality console command. Minimum roughness value of the reflective material, at which the SSR effect is fully visible. Using this option together with Visibility Roughness Max allows reducing noise of reflections on rough materials. Maximum roughness value of the reflective material, at which the SSR effect is not rendered. Using this option together with Visibility Roughness Min allows reducing noise of reflections on rough materials. Limits imitation of reflections in areas where SSR cannot get information. The higher the value, the less this effect is. Limits imitation of environment cubemap occlusion in areas where SSR cannot get information. The higher the value, the less this effect is. This parameter is mainly used for indoor environment to correct false reflections on occluded areas (false reflections are replaced with black color). For outdoor environment higher values of this parameter are recommended.